← The CSNAT Approach online implementation toolkit: coming soon! 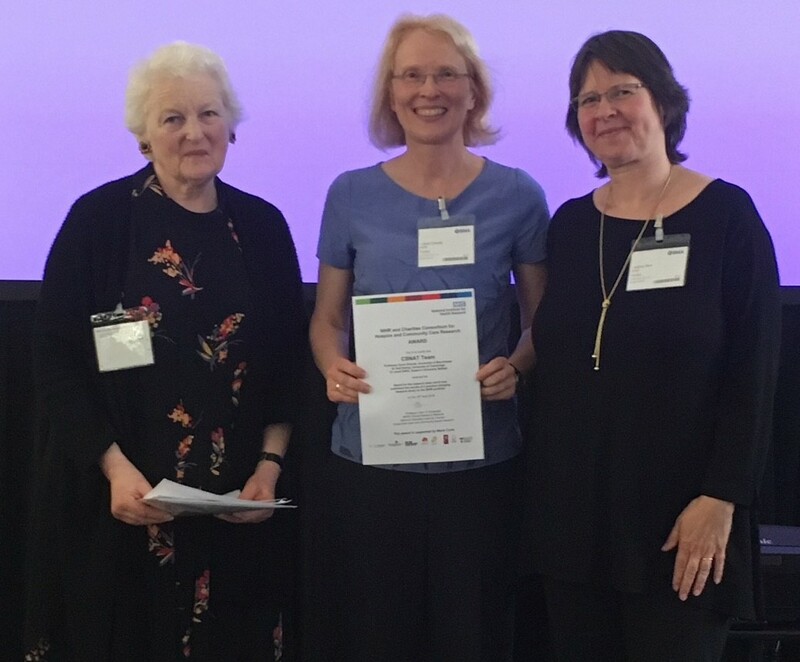 The CSNAT team were delighted to receive the award for the Research team which has published the results of practice changing research study on the NIHR portfolio at the first ever NIHR Charities Consortium Conference for Hospice and Community based Research. Professor Gunn Grande collected the award on behalf of the CSNAT team (Prof Gunn Grande, Dr Gail Ewing & Dr Janet Diffin). To view a copy of the presentation Prof Gunn Grande gave on the day to demonstrate the impact of the CSNAT programme of work please select this link. Pictured left to right: Julia Neuberger, Prof Gunn Grande (CSNAT team), Sabine Best (Head of Research, Marie Curie). This entry was posted in Latest News and tagged carers, palliative. Bookmark the permalink.